Strathblane Falconry is a bird of prey centre situated in the grounds of the well-known Strathblane Country House Hotel. The surrounding countryside is spectacular, yet only 30 minutes from Glasgow city centre, and provides the perfect venue for an exciting and unusual day out with all the facilities of a country house hotel. Whether you are a visitor to the Glasgow area looking to experience the Scottish countryside, a local resident wanting to know more about falconry, a school or party wishing a demonstration, or a business looking for a venue with something a little different, then Strathblane Falconry will be pleased to help you to arrange a programme to suit your needs. Please note that Strathblane Falconry is open to individuals or small groups by prior appointment only. We do not list opening hours anywhere on this site because we are not open as a visitor centre, we can however take bookings 7 days a week to best suit your needs and operate wholly on a first come first served basis so please call or email us to book. Strathblane Falconry is about giving people the opportunity to experience the thrill of handling and flying birds of prey for themselves. Would you like to try falconry, but not too sure what is involved? At Strathblane Falconry we can tailor the experience to suit the individual's needs, be it a hands on flying experience or as a spectator at a demonstration. You'll learn about the art of falconry, care of the birds and how to fly them amidst some of Scotland's most spectacular scenery. 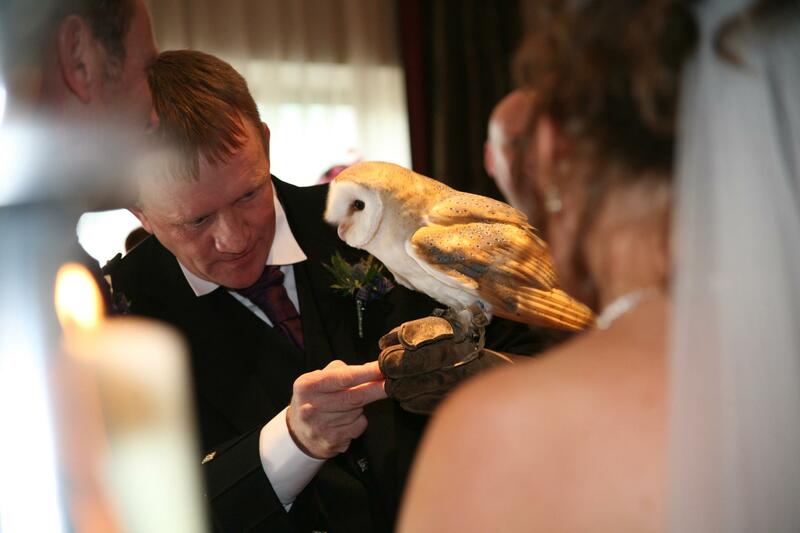 What could be more romantic than having your wedding rings delivered by one of our specially trained Owls? Swooping low over your guests they can deliver your rings indoors or out helping make your wedding day one you will always remember. For that extra wow factor why not arrange a flying demonstration for your guests before your reception? It's the perfect way to keep people entertained while you are off with the photographer. We have over 20 birds in the centre at any given time, each with their own personality, likes, dislikes and roles. From Kes, our tiny American Kestrel through to Artemis the huge Steppe Eagle, each of our birds is as individual as you are. Meet some of our team and find out more about the sport of Falconry, the birds and how we fly them by following the link below.